Stephen Trohoske knows his jazz. In fact, the local composer and master of the bass face could probably maintain a groove while flashing jazz hands at the crowd, logic be damned. 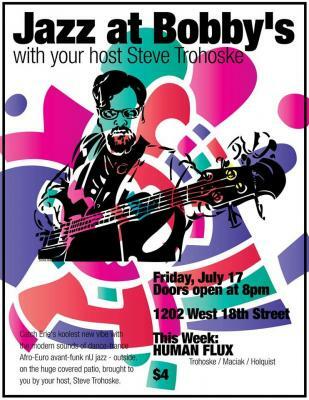 This week, Trohoske will be joined by fellow Erie musicians Ian Maciak and Adam Holquist when the talented trio perform under the name Human Flux at 9 p.m. Friday at Bobby's Place. Trohoske hosts Jazz at Bobby's Place, a semi-regular series devoted to bringing The Flagship City special displays of jazz experimentation. Human Flux takes advantage of the creative minds of its three members to combine dub and electronica to craft evolving soundscapes that shift as you watch them play. Life can be rather dull without some new experiences. Jazz at Bobby's Place is your place to see a show from a band that lets the music do the talking. Take the opportunity to see just what you can do when you put your mind (and hands, because instruments) to the task when Human Flux plays at Bobby's Place for the low price of $4 this Friday. Doors 8 p.m., show at 9 p.m. Friday, July 17 // 1202 W. Raspberry St.